Whether you’re a harissa fan or harissa what?, learn about this spicy North African condiment and try out a few recipes – you’ll be hooked! Today, I’ll share a habit I started while in Tunisia on the #wholelifechallenge – limiting starches, sugars, and dairy – by incorporating harissa into an omelet for a spicy, satisfying, and nutritious breakfast or dinner main course. I’ll share my recipe for spicy harissa hummus as Part II in an upcoming post. 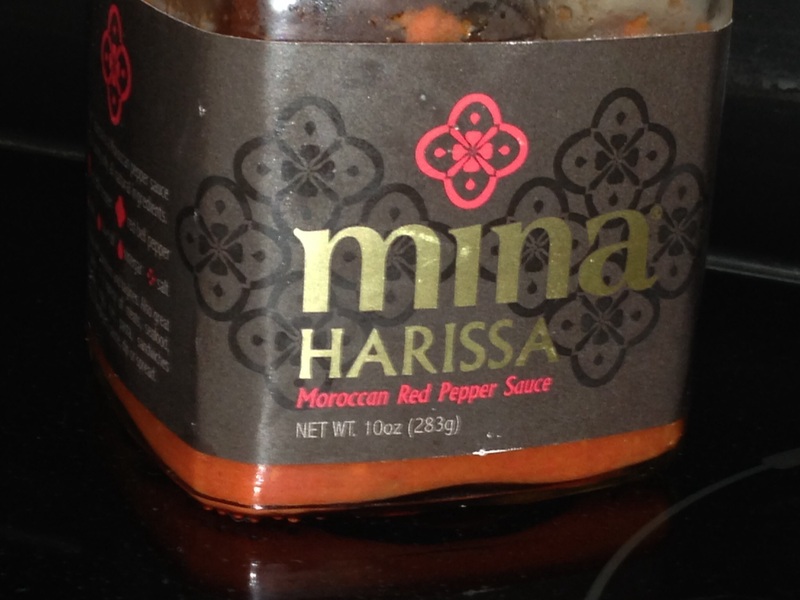 Harissa is a red pepper and chile relish common in North African cuisine. If you’ve eaten at North African, Mediterranean, or Middle Eastern restaurants, you’ve likely tried it but perhaps never realized you’d done so. At first glance, its deep crimson hue and ingredient list look much like siracha or sweet Asian chili sauce. I’m amazed at how quickly siracha has morphed from an Asian specialty item to a mainstream flavoring – so mainstream, in fact, it has found its way into international brands of packaged potato chips/crisps. All three condiments add fire from red chilies and a touch of garlic to savory dishes, but don’t mistake harissa for siracha. The defining differences between the two are vinegar and sugar in siracha; olive oil and roasted bell peppers (capsicum) are key ingredients in harissa. If siracha and harissa were people, siracha would be the loud, boisterous person at a party, telling raucous jokes with fervent energy; harissa would be the person you might not notice initially, but after you end up in a two-hour conversation, it hits you that this person the reason you had such a great time. Siracha packs a tangy punch and stands out; harissa is more subtle, with a smoky, slow burn and a classy touch of olive oil. If you’re familiar with siracha, give harissa a try. You can find it at many grocers and supermarkets, grouped with other condiments or ‘international’ foods. A great way to use harissa’s flavor is by incorporating it into an omelet. It’s a great compliment to vegetables and a healthy, low-calorie flavor additive. Especially if you’re vegan or lactose-intolerant (or just watching calories/fat), a small amount of harissa, alone or together with the spice/sesame blend, za’atar, transforms the tired, basic omelet into something new and exciting. In Tunisia, my breakfast egg/omelet station had a jar of harissa, so one morning, I asked the cook to add harissa to my egg white omelet, and a new favorite was born. Back at home, I began adding in harissa and the spice/sesame blend, za’atar into my omelets for a quick, single serving meal. This dish is more of a serving suggestion than a step-by-step recipe, so follow your own favorite recipe or personal omelet technique. If flipping omelets is outside of your culinary comfort zone, make it frittata style in a cast-iron skillet by cooking initially on the stove and then transferring to the oven (approximately double the ingredient proportions listed below). Additionally, I’m not a huge fan of eating eggs on their own, so I often use egg whites, which are less sulfuric to my tastebuds, as well as low in fat and high in protein. If you ever choose to make any of my ice cream recipes, omelets are a great way to use leftover egg whites. Waste not, want not! *I use whatever vegetables I have on hand. My favorites are red bell peppers, onion, sun-dried tomatoes, spinach, and crimini mushrooms. I tend to go heavy on the vegetables, cooking and folding in to the omelet a full cup of raw vegetables (1 1/2 cups raw spinach alone, as it wilts significantly when cooked). For a ‘prettier’, more technically easy omelet, cook the vegetables, then remove and reserve 1/4 to half cup as a side dish before adding egg. Heat the oil in a nonstick omelet pan (frying pan) over medium to medium-high heat. Add vegetables (excluding any leafy greens) and za’atar. Cook until just tender/al dente – about 5-7 minutes. Meanwhile, lightly beat the eggs or egg whites with a wire whisk or fork until slightly bubbly. Set aside. If using greens, add to the omelet pan. and stir until wilted. Next, pour the egg into the pan and swirl the pan to evenly coat the pan. Drizzle harissa strategically over the egg/vegetable mixture to disperse it. When the egg begins to bubble, test the underside of the omelet by gently lifting with a spatula. If it peels easily from the edge of the pan, continue to slide the spatula from the outside in to lift. Fold or flip the omelet to cook the top/inside until slightly browned. Remove and serve with reserved vegetables, plain Greek yogurt sprinkled with za’atar, and/or more harissa.